Obama's carbon emissions proposal hasn't destroyed the economy. Coal conveyors in Printer, Kentucky. As of Friday afternoon, the stock market had reached record highs. It’s clear that, at least from the perspective of industry and business leaders, the much-feared “war on coal” isn’t going to wreck the economy. In fact, the new rules probably won’t change things much at all. Wall Street largely shrugged off this week’s proposed EPA rules on cutting carbon pollution from the country’s power plants, mostly because they were planning on doing it anyway. According to InsideClimate News, fear of the guidelines turned out to be largely overblown. Some company stocks had already taken a hit in anticipation of Monday’s announcement, so share movements after the plan’s release could reflect only part of the market’s reaction. The increases in some stock prices could reflect a measure of relief that the impact may not be as damaging as expected. The gradual phase-out of the dirtiest coal power plants in America is inevitable. Thanks to the booming natural gas industry and the quickly plummeting cost of solar, coal is already becoming obsolete. Those trends were in place before Obama’s rules, and aren’t likely to change that much. We actually saw this in Europe when similar rules were imposed. What actually happened in that coal plant owners decided to run their plants flat out while they could still emit. They made their capital back that way, by running at overcapacity, not maintaining and not upgrading. By the time that they will have to go out of service they’ll be so clapped out that there’s no economic value there anyway. 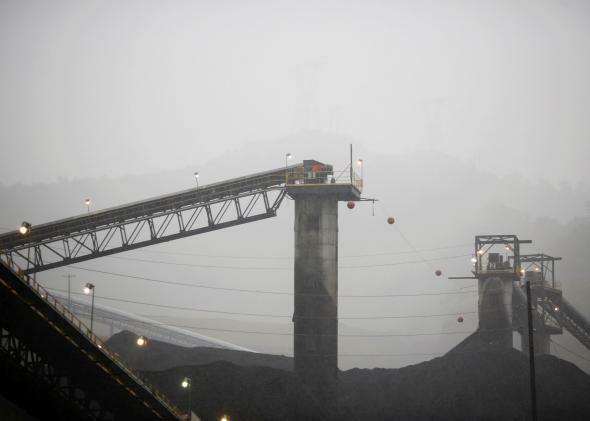 Stock prices of coal companies actually rose this week, following the EPA’s announcement. That’s likely because the industry was expecting them to be worse than they were. As of midday Friday, an equal-weighted average of seven major coal stocks has risen 0.44 percent since Monday morning. That’s not to say coal is an especially good investment. On Friday, analysts at Goldman Sachs downgraded Peabody Energy, the world’s largest private coal producer, from a “buy” rating to a “neutral” rating. The same group of seven leading coal stocks are down 1.46 percent so far this year, compared to gains of 1.96 percent for the Dow Jones Average and 5.41 percent for the S&P 500, both of which hit new all-time highs on Friday. Still, Wall Street as a whole is bullish on the future of Peabody—which is sometimes used as a proxy for the entire coal industry. Currently, 12 analyst agencies give it a “Buy” rating, six a “Hold” rating, and only one a “Sell” rating. After all, once American utilities stop buying coal, there’s always China.